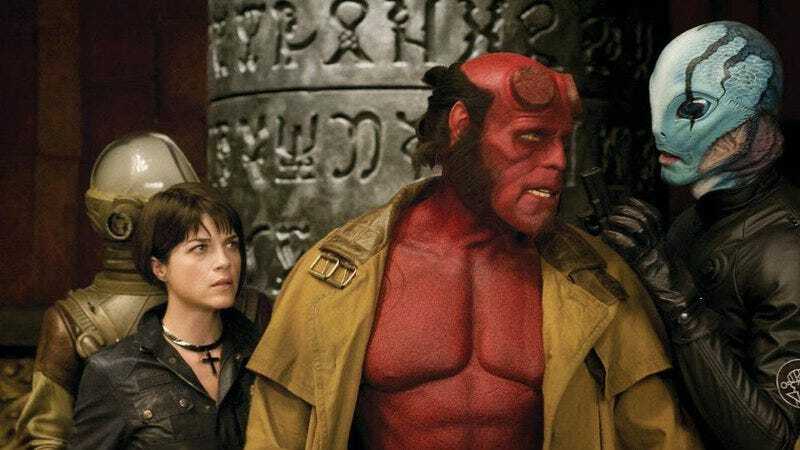 Guillermo Del Toro’s two Hellboy movies weren’t exactly Phantom Menace-style showcases for the latest advancements in CG technology, but Hellboy reboot director Neil Marshall is still making it a point to reassure fans that his movie will have plenty of old-school practical effects. Marshall offered that tidbit on a recent episode of the Post Mortem podcast (via Bloody Disgusting), adding, “I love to do stuff in camera whenever I possibly can and use CG as the amazing tool that it is, to enhance or expand upon the world,” but he doesn’t like using CG to “replace reality.” Hopefully that means that new Hellboy star David Harbour will be covered in layers of bright red prosthetics like old Hellboy Ron Perlman, since that’s a much cooler look than simply using the actor as a stand-in for some cartoon monster. Who knows, maybe that was one of the things Harbour and Perlman talked about during their recent armistice dinner. Also on that same podcast, Marshall confirmed that his movie will be R-rated, which he thinks will free him and his crew up to “make the movie we want to make.” Previously, Marshall had teased that the new Hellboy—tentatively called Rise Of The Blood Queen—will be “darker” and “more gruesome” than the old ones, and an R rating should make that a bit easier to pull off.